Sessa Key Largo 17 is a 5 meters long motorboat with sundeck, perfect for spending a day on the sea, with your family and friends. It can take up to 5 people. It comes with 70hp engine, easy to navigate, and easy to reach preferred destination. From the equipment, boat has ladders and awning for protection against the sun. There is also Raymarine Dragonfly GPS for easier navigation. Boat is new, and in great condition, and it will provide you safety and comfort on board. 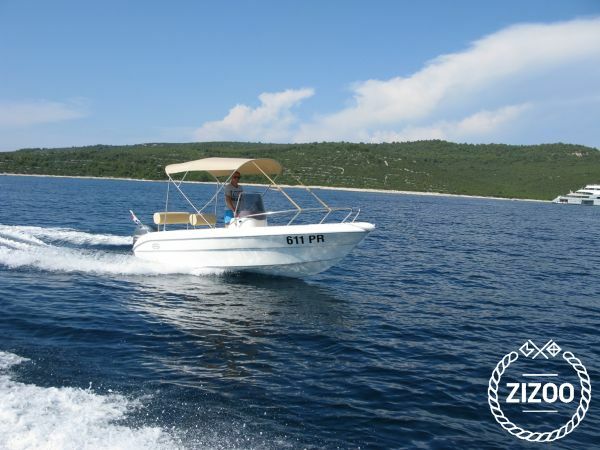 Boat is located on island Ugljan, just across city of Zadar, and can be transfered to Zadar for no extra costs. By boat you can visit the entire island Ugljan, as well as island Iž on the West side and island Pašman on the South, Dugi otok, Kornati national park, Saharun beach, Lojena beach etc..